Walking Diplomat: Lamu-there's no place like it. Lamu far exceeds them all. A visit to this part of Kenya’s east coast is incalculable. Historically unfamiliar to me before I disembark from the Fly540 carrier from Nairobi’s Wilson Airport, I step onto the stony sandy soils of what I call, Africa’s Little Giant Wonder. The transition from the potholed clouds to the disturbingly hushed welcome at the mini landing site jolts us into an unnecessary panic. What happened to the endless oceans and beaches that the brochures talked about? Waiting in unbudgeted for anticipation, we hear a rusty voice yelling, Jambo! Trudging along, we line up our luggage on the gaping rickety dock. The boat tilts as we all clamber on board. At the tip of the dock, the Indian Ocean is a tiny rivulet searching for an outlet to its magnificence. The boat steadies on the waters while gaining the trust of the wide ocean. The boat shakes in excitement of carrying twenty or more writers to a festival on Lamu Island. The secrets of Lamu’s realities are concealed from the naïveté of our pens. Each of us looks ahead at the island not so far off, scratching our minds for an opening paragraph to describe the ugly beauty of the unknown. Interestingly, Lamu does not spread out its vanity with white sands, blue oceans and setting suns-no. It deceptively creeps up on you and hypnotises you with its intoxicating simplicity and selflessness. There are not placards to welcome us for our week long writing festival. There are no minivans guided by manipulating tour guide companies to drive us around the block to our lodges. The boat stops near the water’s edge and springing out of nowhere, hundreds of beach boys jump on and start heaving our luggage onto their bronze (not proud of the word bronze) backs. Lamu’s community must have like 30% beach boys. This is yet to be statistically proven. I look on as the sturdy young men whose orange dreadlocks dance about over their sweaty backs carry our luggage calling out the different names of lodges and hotels. Finally we get to a large wooden door which can easily fit into the tale of Ali Baba and the forty thieves. It has an ominous looking brass knocker. Opposite us is a video stall. The boys manning it smile at the three of us ladies. I wonder if they will be our inspiration to write. The ominous looking door opens. There is space. There is sparse and yet exquisite furniture. High ceilings. Fans. Lots of space. Gold and silver lined cushions. Craft. The housekeeper ushers us in. The coolness from the fans and fresh banana juice are our first real treat on the island. We realize then that Lamu does not adjust its taste to suit its guests; we have to fit into its gentle stride. Our beds are protected by mosquito nets but not from the heat as we realize later that night. I reckon that I will need at least five baths a day as I take my first one soon after arrival. The heat settles on my inside like a big sleeping baby. Unlike my usual travels where I am restless to sightsee, the slow pace of Lamu diminishes my touristic anxiety and I sleep the afternoon off. It is difficult to distinguish the evening from day in Lamu. Promptness and urgency are but luxuries. At 2am, people stroll to the nearest bar and pack themselves on a boat as they set off to another island. The giggly girls who throughout the day are hidden under veils allow the men to tease their hair. At night, spectacularly and inconceivably, luminous bugs cruise alongside our boats. They illuminate the dark coloured ocean and marvellously appear as if out of nowhere. In the day time, the invisible bugs elude us and at night, tease our imagination and come to life in this amazing way like tiny fish the size of mustard seeds. Simply incredible. We forget our invitation to the writers’ festival and allow ourselves to be led by Lamu and its beach boys. Mornings begin with a 9am shower and for breakfast, we have what is arguably East Africa’s best brewed coffee. This is followed by pancakes and syrup, fruit, juice and then of course another nap. Our walks take us through different routes on the old town. The buildings are so close by and the narrow streets look the same to us. However, our curiosity takes us to other places. And we discover Aly King. Now, being December and a few days to Christmas, Aly King is someone everyone on the island needs to know. Aly King is a coastal who is a master at tailoring. He sits at his machine and within record time, has tailored outfits that Elle magazine would be jealous of. We stumble upon Aly King by accident. Drapes of airy print, tie and dye, baby suits and others hang outside his shop. Tantalised by the colours, we move in. Aly is like a wizard at the wheel. Customer after customer lines up. Aly sews clothes for families over Christmas; he weaves together outfits for tourists to boast of as they return home. Our job is just to watch and wear. Lamu is not Lamu without Aly King. The donkeys attempt to pick up the pace at the otherwise unhurried Lamu Old Town. They trot past us dropping their leftovers to guide us to the next stop. The medieval 14th Century settlement of Lamu has a canon that stands motionless hiding stories of conquests and war. The dhows remind me of my primary history. The Lamu Museum ,built in 1891, has wooden doors carved locally in the Omani and Indian styles with old Lamu kitchen utensils. Each day the beach boys call out to us. With only one thought and that is to have fun, we allow them to take us to Shelah. 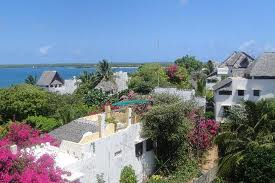 Shelah is one of the more posh islands, about an hour’s walk away from Lamu Old Town. This crystal blue part of the ocean is inviting. Here, there are limited or no inhibitions about Islam tradition and so we feel free to walk in our costumes and while the time away, swimming while gazing at the equally leisurely Lamu sky. The henna ladies come eagerly and shyly towards us. Speaking little English, they show us pages of patterns which they are willing to draw on our hands and bodies at a minimal fee. We marvel as they transform our palms into flowers and ship anchors until our fingers are soon singing the songs of henna. Lamu has the knack of letting you let go. Chatting with the beach boys’ stories of instant happiness, chewing mira to let go of pain and taking part in the Swahili weddings. I learn that many have met their aspirations of getting married to an Australian, Norwegian and Dutch and so spend half of the year abroad and the other half on the island chewing mira and making sure everything is just as they left it on the island. Nothing to worry about. Time stands still in Lamu. Apart from the 4am alert of the Imam and the impatient donkeys, everything remains at the same dawdling stride. I shudder to imagine if rumours of investment are true. There is no need for that in Lamu; it is an investment of history and pleasure in itself. By Beverley Nambozo Nsengiyunva First published in The Sunday Vision newspaper.